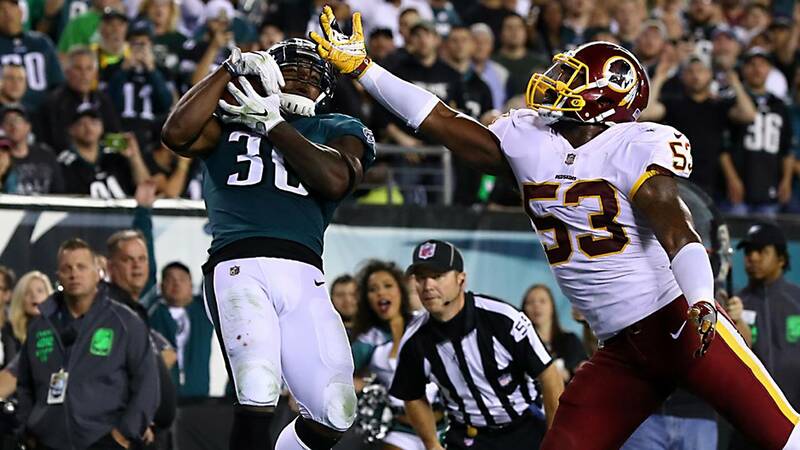 Corey Clement of the Philadelphia Eagles makes a catch to score a touchdown against Zach Brown of the Washington Redskins during the third quarter of the game at Lincoln Financial Field on October 23, 2017 in Philadelphia. WASHINGTON (CNN) - Members of the military hoping to tune into this weekend's NFL playoff games on AFN will be sorely disappointed. While active duty members of the military are considered essential personnel and will continue to work despite the government shutdown, their entertainment options are affected unless Congress and the President can come to an agreement. According to the Pentagon, the Armed Forces Network, known as AFN, will not be operating during the government shutdown. AFN provides US radio and television news, information, and entertainment programming to active, guard, and Reserve military service members, Department of Defense civilians and contract employees, and their families overseas, on board Navy and Coast Guard ships, and other authorized users. The network provides eight television, 12 radio, and nine streaming Internet radio services to military audiences in 168 countries and US Navy ships at sea around the world. Because AFN is run by the Department of Defense, operation of the network came to a halt when the government shut down at midnight. All of AFN's social media channels displayed the same message on Saturday alerting viewers that services are unavailable due to the shutdown. White House press secretary Sarah Sanders tweeted about the outage on Saturday, saying she received an message from a young man serving in Afghanistan showing a picture of the AFN screen explaining the outage due to the shutdown. "I received this from a young infantryman serving in Afghanistan this morning. Sad that the men and women who have sacrificed so much are deprived of even the most basic connection to home bc Democrats are playing political games. #SchumerShutdown," Sanders' tweet read, employing the political message the White House has been using during the shutdown.